If you followed us on Instagram last Friday and Saturday you would have seen a few of our favourite things from Sydney Indesign 2017 pop up in your feed as we made our way around the showrooms and design venues to discover, touch and feel all the fabulous new products and designs. But if you missed it, here are the best bits from when we were #outandabout . . .
We loved the Symbol Pendant Lights designed by Melbourne-based studio Satelight which are inspired by jewellery, in particular paying homage to decadent earrings. Alex and Jess ready to pound the pavement in search of the greatest new products and designs for the homes of our wonderful clients. We loved the vibrant and fun Sydney Indesign branding this year! We were thrilled to finally lay eyes on the Mito Lamp by Tom Fereday in real life, after it was showcased at Salone del Mobile in Milan earlier this year. The Earp Bros showroom was a favourite for all of us this year. This display by Tom Fereday beautifully captured the latest furniture and lighting designs. Showcased alongside prototypes and models, the display told the story of each of the designs, highlighting the creative process and the evolution of each piece. 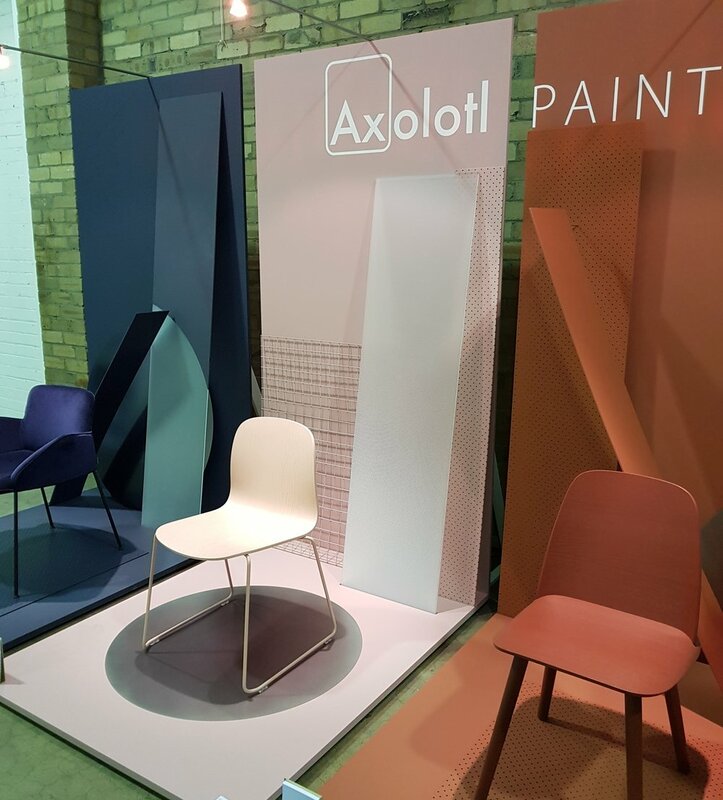 The three new shades launched by Axolotl Paint are simply perfection. Maddie, Natalie and Demi enjoying a well-earned refreshment. And a moment to put their feet up . . .
. . . before discovering Pure Interiors new range. We are obsessed with the bathroom vanities, kitchens and wardrobes. Pure elegance and luxury. We have a crush on the divine Pieman chair by Tom Fereday and we can't wait to find a home for it! The Pure Interiors glass robe doors with leather shoe slings were to die for! They also know what we want with their deluxe leather laundry baskets. Swoon! Marmo Furniture caught our eye with their bright, bold furniture pieces that you just want to touch!